If you’re blogging or thinking about it then chances are you know that takes time and a bit of upfront costs. You also likely know that you can make lots of money blogging. 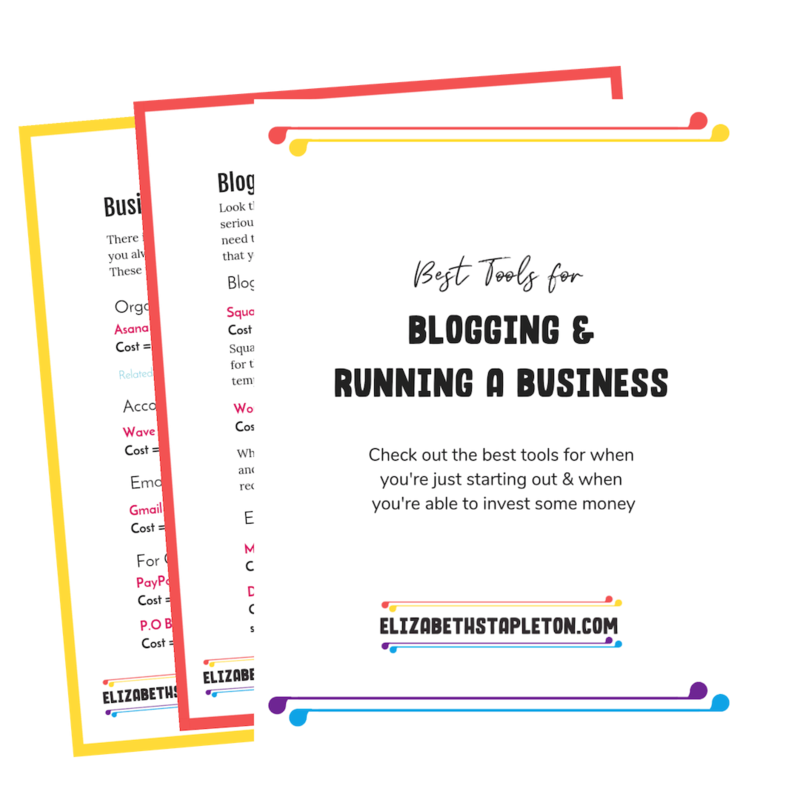 And all of those blogging income reports are very exciting, but how do you actually make money blogging? There are lots of way to start earning money from a blog, but they boil down to four main paths. 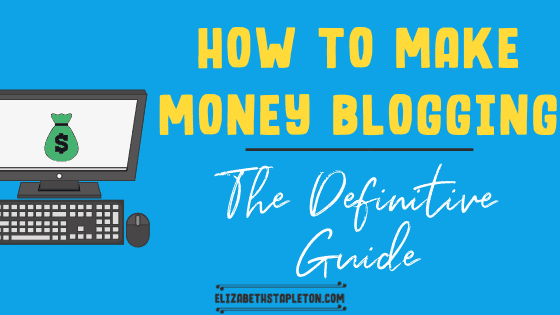 In this guide I’m going to help you understand each blog monetization method so you can implement them and help you to figure out which methods are right for your blog. Whether you got into blogging to make money or you started your blog and just realized you can actually make money blogging, all the different ways and strategies to make money blogging can be overwhelming. Additionally, what monetization methods you see others using may not be right for you. There are tons of ways to make money from your blog. But you need to keep in mind your audience and what they want. So long as you are following the rules (aka the laws) you can monetize in several different ways, but don't dive in and do it all at once. 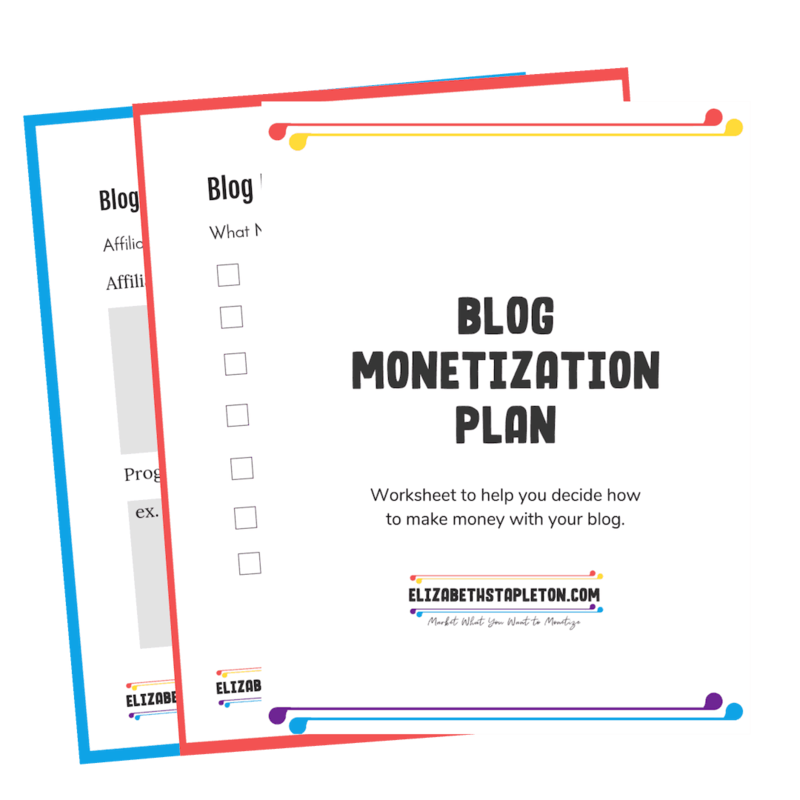 Carefully think about each way you want to monetize your blog. Once you decide on the monetization methods you want to pursue, implement them one at a time. Pretty much every way to make money can fall into one of those 5 categories. But keep in mind your income with any of these strategies will be limited if you’re not producing great content on your blog. Successful bloggers know that to make money blogging they need to be providing value with their blogs, they do this by giving their audience solutions to their problems. If you hate the idea of ads on your site because of sites that have them plastered everywhere, keep in mind that you can do things differently on your own blog. You don’t need to have tons of ads to make money, in fact plastering your site with them is likely to result in less income. How much you can make with ads depends on a lot of factors. You can make plenty of money without tons of ads. It’s a matter of where you put them and what ad network you’re apart of or if you’re doing private ads. I’m going to explain both for you in this chapter. While how much you can earn with ads can depend on lots of different thing, a study by The Blogging Millionaire showed that at around the $7,500 blog income mark ad income peaks. This is primarily because ad revenue is based primarily on pageviews. Early on you see bigger jumps in pageviews from month to month, but eventually your page views will plateau and you can monetize better in other ways. Another factor in how much you earn is the ad network you use. The study also showed that bloggers making over $2,000 a month had vastly different ad earnings based on the ad network they used. Ad earnings can be pretty passive, all you need to do is apply to an ad network, install the code on your site and sit back and let it work it’s magic. However, if your site is growing you’re going to want to pay attention to see if you could qualify for a better ad network. If you don’t pay attention to those stats, you could be leaving money on the table. When looking at ad networks you can estimate how much you’ll earn based on RPM, but if you’re new to ads, then “RPM” isn’t really going to mean that much to you. Just know the higher the RPM is the more you’ll make. I dig into some real world examples of how much people make with different ad networks below. Now let’s really dig into utilizing ads to make money on your blog. When people think of ads they are usually thinking of display ads, but private ads are another avenue you can take with your blog. Private ads have you working directly with the advertiser to sell ads, which means you can set a flat amount (guaranteed amount) for monthly placement of the ad(s). Display ads are where you work with an Ad network. There are several different ad networks out there and I’ll get to them in a second. What an ad network does is act as a broker for the ad space on your site, working with lots of different advertisers to help you make the most for that ad space. It all happens in the background and you’re never involved in the bidding process for that ad space. It requires a lot less effort on your part, but you are not guaranteed any particular amount of money. Every site is a little different in it’s layout, so I can’t say definitively where you should put YOUR ads. But some good places include: the sidebar, header, footer, and in content. If you don’t have a sidebar, you might have a couple of ads throughout the content. Remember it’s a fine line between monetizing your site and annoying your readers. So when deciding how many ads to have and where to place them think about the experience you would want to have as a reader. Currently, I have an ad in the sidebar, one before content, one in the content, and one after the content. If you’re just starting out and have less than 10,000 pageviews your best bet for an ad network is Google Adsense. The other option at this level is Media.net but I’ve used both (one on each site) and I earned a lot more from Adsense than I did Media.net even when factoring in the difference in pageviews. This seems to be because I consistently earn with Adsense, where I don’t with Media.net. My best ad revenue month with Media.net was April 2018 where I earned just under $14.00. But most months I earn $0.00 even though my pageviews don’t fluctuate much. Since I’ve had Less Debt, More Wine and Adsense longer I’m able to go back into my reports to find how much I earned for somewhat similar traffic. Crunching some numbers means Media.net had about 21.7% of the impressions as Adsense. So applying 21.7% to the Adsense earnings = $17.69. While it’s only slightly more than what I earned on Media.net, it was consistently earning, which is why I would recommend Google Adsense over Media.net for bloggers getting under 10,000 pageviews per month. I’ve never worked with Monumetric, but according to The Blogging Millionaire Podcast study, you are likely to earn more with them. And after doing a little digging into various blogger’s income reports, this appears to be true. Foxy Folksy’s income report from July 2017 shows income from both Adsense and Monumetric. Assuming they got the same number of pageviews (looks like it’s one site), Monumetric earned her almost double what she earned with Adsense. MediaVine which refers to itself as full service ad management rather than an ad network is relatively new to the scene having make a big splash in the last few years. They offer good RMP but for people at a lower page views level than AdThrive. The started in the food blogger niche but have since expanded to include several different niches. They are considered the go to ad network as soon as you hit their 25,000 session requirement which you usually hit around the 30,000 page view mark. While I’ve not used MediaVine myself, I’ve worked with the MediaVine people in other ways and I can say they are truly awesome. If you’re wondering how much money bloggers make with MediaVine they put together a list of income reports from bloggers. Bloomly is even more new to the scene than MediaVine and similarly refers to itself as a full service ad management program rather than an ad network. They focus on creating the best ad experience for your audience. Making the ad experience on your site customized for your reader. I’m currently in the process of moving Less Debt, More Wine over to Bloomly. We’ve ran into a few tech issues on my end, but they’ve been amazing and fast with responses to get it sorted. I’ll update this post with how it’s doing once I have had it going for a full month. Bloomly is currently in beta, but you can join the waitlist. In the meantime, they have an active Facebook group that anyone can join. If you’re new to blogging, getting to know other bloggers in a group like this is a great way to grow your network. Once approved, they’ll send you an email with instructions to get started. While it may sound daunting it’s actually pretty simple to install ad tags. First, you need to determine if your theme comes with some easy ad insertion, some themes like Thrive Theme’s Performag do, others do not. That’s all there is to it, keep in mind it may take up to 48 hours for ads to start appearing on your site. This is because Adsense is learning what content might do best on your site. Chances are you’ve done some form of affiliate marketing before without realizing it. Have you ever recommended a product you love to a friend and shared a referral link so you both get a bonus? If so, you’ve already dipped your toes in affiliate marketing waters. While there is a right way and wrong way to do affiliate marketing, it can be a great way to monetize a blog long term. It takes time to start with affiliate marketing, but once set up it can continue to earn you money for years. In this chapter I’m going to cover what affiliate marketing is, the disclosures required, what to look for in an affiliate program, and some best strategies to success with affiliate marketing. Affiliate marketing means sharing links to products or resources you love and have a relationship with or being a part of their referral program. When someone on your blog uses your affiliate link, the company sends you a thank you in the form of compensation/money, at no cost to the customer. It is important to realize that the law requires you to disclose your relationship with the product when you are sharing affiliate/referral links. The FTC requires that you disclose the fact that you may earn money if someone clicks on a link. Moreover, the language you use matters. A lot of people don’t know what “affiliate marketing” is so disclosing something as an “affiliate link” isn’t sufficient. Basically they have to be reasonably informed before they click on the link, meaning a disclosure at the bottom of the page will not work. Good affiliate marketing is all about being honest and transparent with your audience. Direct affiliate programs are where you work with the company directly. Affiliate networks, host several affiliate programs with different companies, allowing you to sign up in one place and have access to tons of different affiliate programs. Some popular affiliate networks include ShareAsale, CJ Affiliate (formerly Commision Junction), and Flexoffers. On face value it might look like affiliate networks are better, and in some ways they are, but direct affiliate programs are usually a bit more lucrative. If a company has both a direct program and is listed on an affiliate network you are likely to earn more from the direct program. This is because there isn’t a third party (the affiliate network) taking a cut. However, some companies only have affiliate programs through networks like ShareAsale, CJ Affiliate, and FlexOffers, in which case it’s better than nothing. Direct affiliate programs on the other hand not only usually have a higher commission rate, but give you the chance to work directly with the company making it easier to ask for promotional items. Affiliate marketing sounds easy, just throw some links up on your site and you're good to go. Not so fast, you're forgetting the marketing part of affiliate marketing. In order to earn money from affiliate links you need to drive traffic to them. This is just one of many lessons I learned taking the Making Sense of Affiliate Marketing Course by Michelle Schroeder-Gardner who earns over $50,000 each month through affiliate marketing. Making Sense of Affiliate Marketing: Michelle is an affiliate marketing maven. She regularly makes over $50k a month from affiliate marketing. I bought her course at the end of Nov. 2016 and these days I regularly make over $500/month with affiliate marketing. She really knows what she is talking about and the Facebook community that accompanies the course is a terrific resource. Learn more about Making Sense of Affiliate Marketing. Posting the links is not enough, you need to continually share those posts and those links. Marketing on Pinterest [link], via email marketing, and through Search Engine Optimization will help to drive traffic to your posts. You can also market affiliate links directly on platforms like Pinterest. People on Pinterest are looking for solutions and inspiration. This makes Pinterest a great place to market affiliate links. Unlike other social media such as Facebook or Twitter where people are looking to connect rather than buy stuff. You want to keep in mind that some affiliate programs or platforms do not allow you to cloak your links. This means you must use the original affiliate link, which usually isn’t very pretty. Most affiliate links aren’t pretty because they include code to ensure you get credit for referring the person to the product. Ultimate Bundles If you click this link and make a purchase, we earn a commission at no additional cost to you. Besides just making the links look better, using plugins such as Pretty Links and Earnist, help to swap out links if something changes. Instead of having to track down every post where you put the affiliate link, all you have to do is update the link in Pretty Links or Earnist. Giving you one place to manage your affiliate links. The last benefit of using a tool like Pretty Links is how easy it is to make a link “nofollow”. Both affiliate and sponsored links must be nofollow otherwise Google may penalize you. Pretty link has a “no follow” box you can check. However, not all affiliate programs allow for link cloaking meaning you must use the awful looking link. So it’s important to know what the affiliate program allows. If you don’t see a checkbox option, you can add the following code on the HTML version of the post by editing the text version. Affiliate marketing can be very lucrative. As I mentioned earlier Michelle from Making Sense of Cents makes over $50,000 per month from affiliate sales (and helps teach others how to make money with her course Making Sense of Affiliate Marketing). Another well known affiliate marketer is Pat Flynn from Smart Passive Income who makes $100,000 a month from affiliate marketing. One of the great things about affiliate marketing is that you don’t need tons of page views to start earning decent money. Though the more page views you have the more consistent your affiliate income is likely to be. In October 2018, I earned $701.90 from affiliate marketing. Mind you this is when I was stuck in a rut and not sure the direction of either of my blogs. I didn’t post a single blog post that month or do much in the way of marketing, meaning my combined page views were just under 15,000. I still made money from affiliate marketing because of the work I had done previously. Affiliate marketing can take a while to get going but once it does you can continue to earn money pretty passively. How much you earn depends on a lot of different factors, but as you can see, earning thousands a month is not out of the realm of possibility. Perhaps the quickest way to earn money online with a blog is to offer services. While it’s not passive, your blog will give you a platform to help you promote services. For example, when I first made the leap to self employment, I did so as a freelance writer. My blog made it happen. Having a website to display my writing abilities helped me to land freelance writing gigs. So when I got laid off in December 2016, I was able to pursue full time self-employment. This was not because my blog made a full time income but because it provided a platform for me to make a full time service based income. While my blog provided the platform it didn’t quite provide all the knowhow. I’ve learned so much from blogging but the admin side of freelancing was a mystery to me, which is why I took courses to help me beat the learning curve. 30 Days or Less to Freelance Writing Success Check out my full review of the course here. Become a Pinterest VA Today! Learn more about what a Pinterest VA does here. While this will vary greatly depending on your experience and the services you offer it will usually be more than what you earn from ads or affiliate commissions. For example, when I started freelance writing I usually made somewhere between $75-$200 per article. Towards the end of my freelance writing, I usually earned around $600 per article. As a Pinterest manager I charge around $350/month to manage a client’s Pinterest/Tailwind account. I have in the past and continue to work with companies to draft a sponsored post. This means the company paid me to write the post about their product. This does not mean the company paid me to write positively about the company. However, my personal choice is to only consider doing sponsored posts for companies I like or think my readers might find helpful. You'll have to decide your own rules for doing sponsored posts and which companies to work with. Keep in mind if you aren't putting your readers first, you won't end up with very many readers and you likely won't be able to charge much for a sponsored post. Also keep in mind that many of the rules that apply to affiliate marketing apply to sponsored content. You must disclose that you received some compensation be that in the form of money or a free product. Your links should be nofollow. Finally, make sure you have a contract that outlines what you and the sponsor agree to so that you know when you’ll get paid and what you’re required to do to get paid. Anyone that reaches out to pay you for a link but doesn’t want it to be nofollow is a scammer, DO NOT DO IT! Google will penalize paid follow links. Once you’re signed up on the networks, you’ll fill out your profile form and can apply to opportunities you qualify for. Many bloggers make money by creating products such as online courses, eBooks, and printables and selling them on their site. You can use a site like Gumroad or DPD to deliver your products. Or you could always work on getting them listed on Amazon. Taking back to that study by The Blog Millionaire Podcast, the bloggers earning the most, did so by selling product. For the bloggers making over $25,000 they did so earning 80% from selling online courses. This is going to be different for everyone, but the common answer is that what you sell must solve a problem for your audience. Guides - more than a printable, but not quite an ebook. This is also likely a pdf an example could be a guide to relocating to a new state. You can monetize several ways, and you should be picky about which ways you do monetize. But don't make the mistake of only monetizing one way. While it might be good to start with just one monetization method, the more income streams you have the more stable your blog income stream will be. If one method doesn't do well one month you'll have other money making methods to help pick up the slack. So let’s break down what ways you might want to get started monetizing. Some things are easier to get started with than others. When evaluating you’re ROI you want to consider how much time it will take and how much money you could make. Ads usually require a certain amount of site traffic before you earn a decent amount of income. But they are extremely fast and easy to get started with. So it’s likely worth the maybe 30 minutes it will take you to set up ads on your site. Affiliate marketing can be easiest to start with since tools you already use likely include some sort of referral program. You may not even have to apply, you just have to go into your account and find your referral link. And as you saw from the affiliate marketing section earlier, once you set up affiliate marketing on your site you can keep earning from it. I earned over $700 in October without posting a single blog post. These all have similar levels of difficulty, with selling products probably being the most difficult as it requires you to have an audience already, make the product, and market it effectively. It would likely be best to start making money with your blog with ads and affiliate marketing then building up your income from one more thing (services, sponsored content, products). Once that one thing is stable, expand to add another income stream to your blog. How do you make money blogging? Let me know in the comments! Previous Post How To Increase Pinterest Click Throughs 5X (A Case Study) Next Post Trello vs Asana – Which is the Best Project Management Tool?